Citing a “vital interest” in attorney-client privilege, President Donald Trump formally asked a federal judge Sunday night to allow his legal team to review records and recordings seized from his personal attorney in a raid last week before the government is allowed to read them. “The privilege-holder should be permitted to review the materials for privilege in the first instance,” Trump’s attorney Joanna Hendon wrote ahead of a Monday afternoon hearing. A hearing Friday in Manhattan federal court was put on hold until Monday after Hendon intervened and requested additional time. Federal prosecutors revealed in court documents obtained by ABC News last week that they have already secretly obtained search warrants for various different email accounts associated with Cohen and found no messages between him and the president. They also argued their internal filter team can properly sift through the material. Trump has made clear he does not trust the federal prosecutors’ “taint team” to do the job. A taint team is a group of people who help determine what falls under attorney-client privilege and should not be shared with investigators. It's standard when searching a lawyer's office. “The appearance of fairness and justice is compromised by the government’s use of the its own personnel to review potentially privileged material,” Hendon wrote. 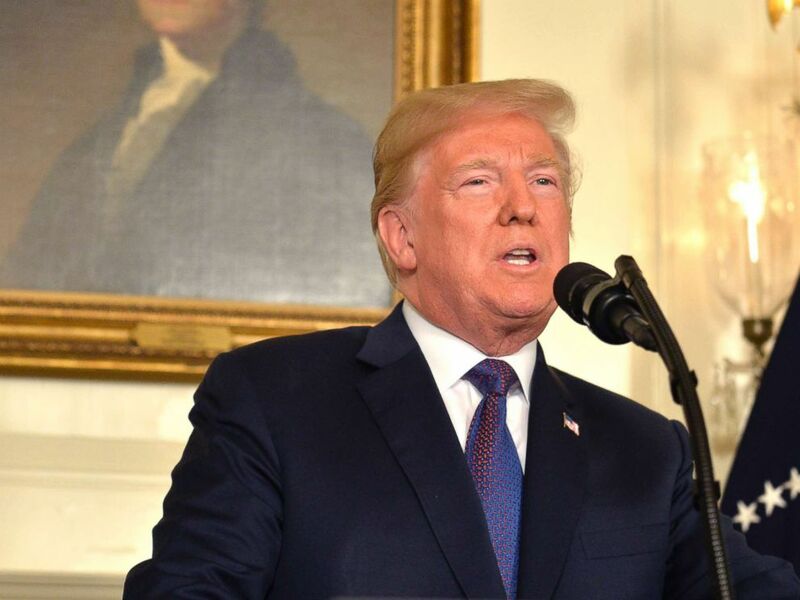 President Donald Trump makes remarks as he speaks to the nation, announcing military action against Syria for the recent apparent gas attack on its civilians, at the White House, on April 13, 2018, in Washington. While Trump will not be in court Monday, Cohen has been ordered to appear so he can answer questions about his legal practice. It is likely, then, Cohen will come face to face with the adult film actress he has paid off. Stormy Daniels plans to attend the hearing, her attorney Michael Avenatti told CNN this weekend. Cohen has been under investigation for months “for criminal conduct that largely centers on his personal business dealings,” federal prosecutors revealed in court documents. Cohen has not been charged with anything. He has not responded to news he is under investigation, declining to comment when contacted by ABC News. An attorney for Cohen, Todd Harrison, argued that either he or an independent, court-appointed third party should review what was seized from last week’s searches in advance of federal prosecutors having access.